Your legs are starting to itch from insect bites. You’ve switched your child’s doona for a lighter cover. And your child is coming into your room at night complaining about the heat. It’s summer time! Although you may be able to cope with this sweaty, sticky feeling, your sensory sensitive child may not cope quite as well. Children with tactile sensitivities have a sensory processing difference where their brain interprets summer’s heat-induced sensations as irritating and painful instead of neutral. Children with sensory processing differences or autism spectrum disorder may also have differences with their body’s temperature regulation. Outdoor play is crucial for developing motor skills and building comfort with bodily sensations, but children with tactile sensitivities often avoid it because of the sweaty sticky feeling afterwards. Here are some tips for your sensory sensitive child to combat those uncomfortable summertime sensations and still enjoy the outdoors! Sunscreen: Try various brands and types. Try spray, lotion, sticks, or zinc. Let your child put sunscreen on you or on a doll to practise the feeling. Put sunscreen on while standing in front of a mirror, so your child can see what you are doing. If you use spray, have your child close their eyes and mouth while you spray. (For more tips about applying sunscreen and preparing for the beach read our article Six Tips for your Sensory Sensitive Child to enjoy the beach). Sweat: Skin gets sticky after sweating. Many children with autism or sensory sensitivities avoid physical activity and exercise because of this feeling. Instead of decreasing the amount of playtime outside, add to it by having a play in the sprinkler or plastic kiddie pool so your child can splash away that sticky skin feeling. If outdoor water play isn’t your child’s favourite, try a shower or fun bathtime in the middle of the day to cool down and wash off the sweaty skin feeling before returning to active play. Footwear: Your child may not like being barefoot. The concrete is very hot, and the grass is too prickly with too many bugs. There are various lightweight footwear options that protect feet while preventing them from getting too hot. If your child doesn’t like the feeling of thongs rubbing between their toes, try crocs, water shoes or velcro sandals…yes, it’s comfort over fashion. Take your child shopping for summer shoes so they can try them on and decide which they like best. If your child prefers to keep wearing sneakers in summer, switch to thin socks to prevent overheating. Bugs: Insect bites make already sensitive skin even more uncomfortable. Spend time outside in the morning and afternoon, instead of the evening, to prevent bites. Have your child wear a bucket hat to keep bugs away from their eyes and ears. Buy combination bug spray/sunscreen to minimize the discomfort for your child of having these applied. Use citronella candles or bug repellent bracelets. If your child does get bitten, apply anti-itch cream after their shower and before bedtime to stop restless nights. Sleep: You may need to invest in some tools to make your child’s sleeping environment more comfortable (and save yourself from getting woken up so much at night). Put a drink bottle with a no-spill spout by your child’s bed and fill it with ice water. Instead of one large bed cover, have 2 covers of lighter thickness that your child can use or remove at night. Keep one cover at the foot of the bed. If you need to open a window, use a fan or white noise machine to block out sounds coming from outside. If your child really struggles with the heat, consider purchasing an air conditioning unit. The best type of unit has a thermostat, so that it cools the room but keeps the temperature the same throughout the night, working harder in the early evening when it’s still hot outside, and working less in the middle of the night. In the comfort of a cool bedroom, your child will get a great night’s sleep as they won’t wake up hot and bothered needing to move the bed covers. Putting these tips into practise can make a tremendous difference to your child’s physical comfort in the summer heat. For more helpful information you may also be interested in reading Six Tips for your Sensory Sensitive Child to Enjoy the Beach, as well as upcoming our articles about swimming. 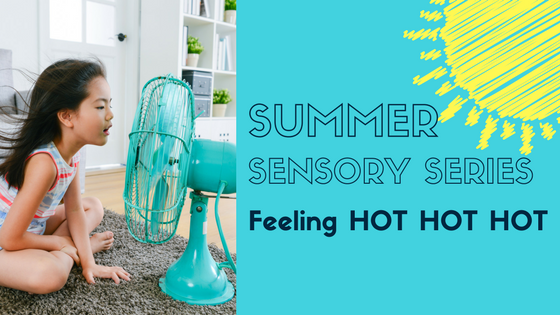 We hope these strategies help with managing the heat this summer but if you decide you would like to look further into the sensory needs of your child or if you would like to find out more about what can be done to help feel free to make contact. To see what times one of our OT’s would be available to talk you can view our locations and availability or if you would prefer to talk to us on the phone you can call us on (07) 5578 2000. You’ve made your point extremely clearly.! You’ve made your position pretty well.! Amazing tons of useful knowledge! Please visit the web-sites we follow, which includes this one, as it represents our picks in the web.